A typical galley with sink, stove, fridge and storage. 5 Comments, Questions, Suggestions, Ideas! We built the frame of the cabinet with Medium Density Overlay plywood. This is a premium plywood water impervious face sheets — its is very stable, takes paint well, and is strong. The doors and front are made from Hickory flooring that is planned down to half an inch and then edge glued. The counter top is Wilson Art (a Formica like material) with more the Hickory used to trip the edges. The 2nd picture is basically a mockup to insure that everything fits in the cabinet and that the boss is OK with the layout. The last picture shows a 2nd cabinet that was added over the galley area window to provide some additional storage. 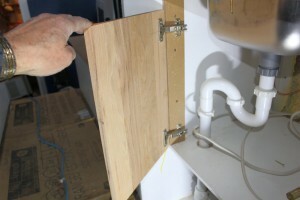 Some conversions place the fresh water tank right in the galley cabinet — this saves running plumbing over to a separate fresh water tank. The water can be pumped from the jerry can like water container to the sink using either a hand pump and faucet combination made for this purpose, or a small electric pump that fits inside the water container. These are basically the kind of stove you would use for tent camping. 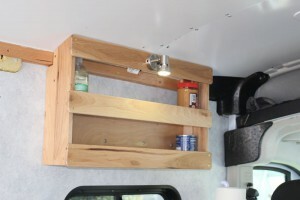 They work out fine for simple camper van conversions. Can easily be used inside or outside the van. They use replaceable fuel canisters – no fuel line plumbing. They cook just as well as fancy cooktops costing 10X as much. Coleman two burner propane stove. My family used one of these two burner Coleman stoves back in the 50’s! Back then the were powered by white gas. You can still get the white gasoline models, but most of the new ones use propane canisters. About $50. There are lots of brands and varieties of one, two, and three burner stoves out there to choose from. If you use it inside the van, seems like it would be important to have a good surface to use it on, and a secure way to anchor it down. Butane stoves use cartridges of liquefied Butane gas. These stoves are typically portable and are available as single burner and two burner — they can be used both inside and outside the RV. The cartridges are a bit smaller and more convenient than the 1 lb propane canisters. The flame is said to be not as hot as propane, but they do cook well. They do not work well at temperatures below 40F as its too cold for the butane to vaporize well. These stove can be plumbed into the vehicles regular fuel tank, so they eliminate the need for carrying a separate fuel for cooking if you have a diesel fueled vehicle. The Webasto diesel cooker has a flat ceramic top with the diesel flame underneath — combustion products are vented outside. On the negative side, the price of the units is high (about $1500), and the installation more involved. I guess this kind of stove could also be used to safely warm up the van on a cold morning as the combustion products are all vented outside. The specs on the Webasco X100 indicate it has a heat output of up to 1.9 KW (about 6400 BTU/hr) — probably enough to warm up a well insulated van fairly quickly. 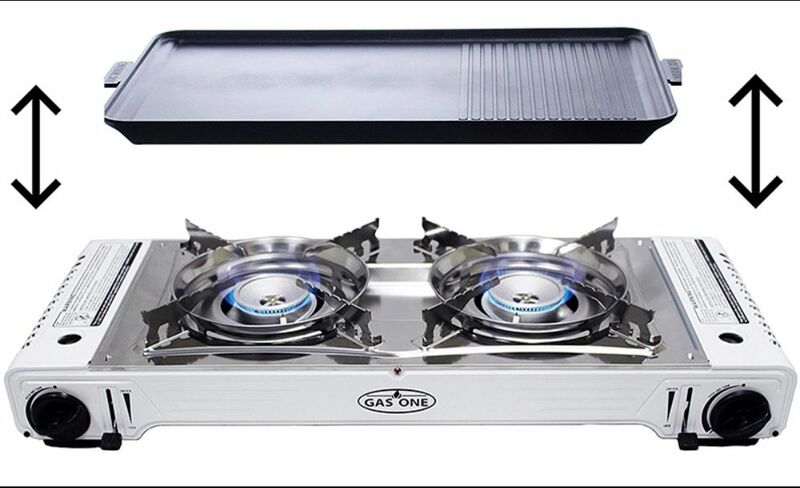 These stoves use a larger propane tank that typically also supplies the furnace and hot water heater in the camper van or RV. 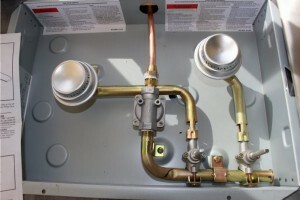 The propane is typically plumbed to the stove and other gas appliances using copper pipe. This is the Atwood model from our RV conversion. This stove has worked fine for us. The cover is nice in that it allows you to use the stove area as extra counter top when the burners are not in use, and it probably makes cooking a little safer. On the down side, burners are manual light and the cover rattles a little on the road (we put a towel under it to stop rattles). About $106. Fancier European models like Dometic (SMEV) are also popular. 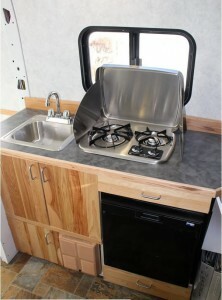 They also sell a combination sink and stove which can make for a more compact galley. Most have glass covers — when down they make for an almost flat counter top space. Available in two and three burner models. $300 and up depending on model. In the traditional RV world, there are also full drop in propane stoves that come with ovens. As a newer trend, some conversions are using electric induction stoves. On the plus side, they are compact, safer in that surface temperature is low, and not expensive. They could also be used outside the van with a good extension cord. On the not so positive side, they are a significant load on the battery pack (see below), and will likely require larger batteries and higher capacity charging equipment to be included. They also require cooking ware that works with induction heaters. There are lots of one and two burner, 1800 watt induction heaters available with prices in the $100ish area. 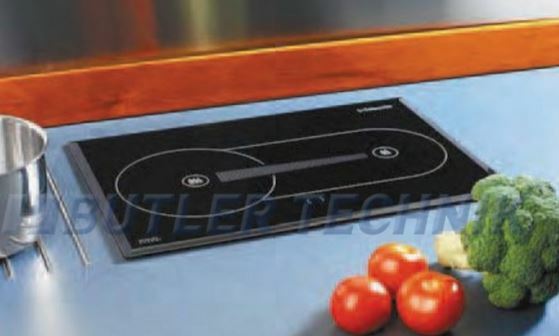 Many of the induction cooktops use about 1800 watts when cooking. If you have (say) the cooktop on for a hour a day, then you will use about (1800 watts/0.9 inverter efic) = 2000 watt-hours from the battery, or about 160 amp-hrs — so, this will likely require a larger than usual battery pack. You will also need an inverter that is capable of handling the 1800 watt load. 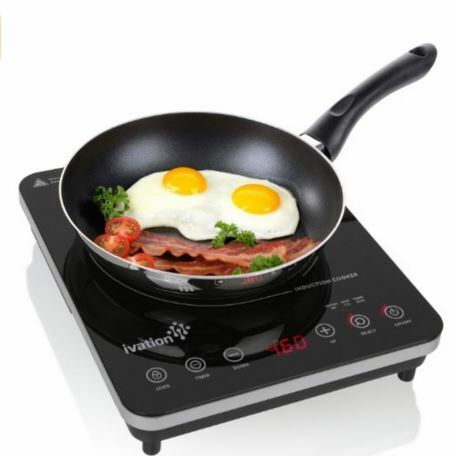 There are, of course, larger induction cooktops with more burners, but these also require more power and unless you are willing to put in a very larg battery bank, are not practical for a camper van conversion. 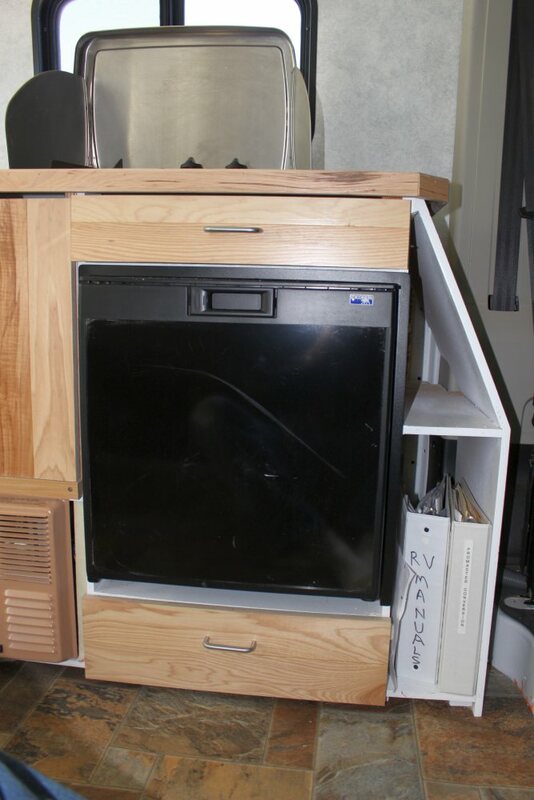 A small microwave is included in some camper van conversions. While full size microwaves take up quite a bit of space and use quite a bit of power, there are more compact microwaves rated at 700 to 800 watts — these probably make more sense for most camper van conversions. One thing to keep in mind is that microwaves are rated on output power, so an 800 watt microwave actually uses something like 1000 watts, and when you consider the inverter efficiency, its more like 1100 watts coming from the battery. If you use the small microwave for half an hour a day, that’s about 600 watt-hours, or about 50 amp-hrs from the battery — this is manageable, but you need to include it in your battery pack design. 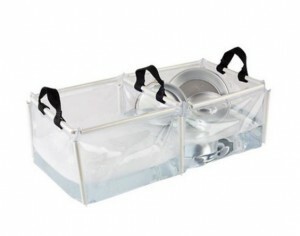 Ice boxes are fine as long as you don’t mind replenishing the ice once in a while. The better ice boxes and chests can get several days from a load of ice. They can be of the chest type with a top lid opening, or can look like a conventional built in RV fridge — like this one… which drains via tube through the floor as the ice melts. 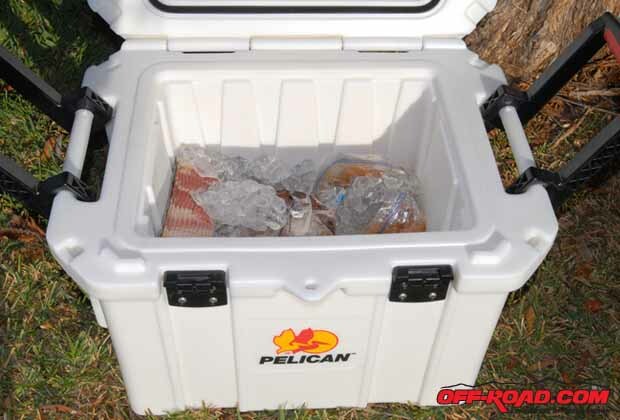 There are some very bomber ice chest models made now by Pelican, Yeti and others. They are a lot cheaper than an efficient RV electric fridge, and they would also allow you to down size your house batteries saving money and space. Three to five days is what people appear to get out of a block of ice in a good ice chest. Seems like it would also be possible to make a good ice chest with very good insulation and do even better? 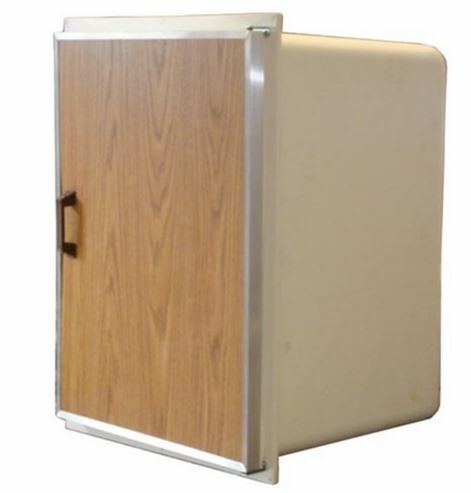 This is a style of fridge that has been used in RV’s for many years. They work on an absorption refrigeration cycle using only a gas flame (or electric heater) as the source of energy. They can run on propane or on electricity. While they are simple, they have some drawbacks: 1) they are not very efficient, 2) they have to be nearly level to work, 3) they require two fairly large holes in the side of the van for the intake and outlet vents, and 4) they are slow to do the initial cool down. The slow cool down time coupled with their reluctance to run unless level can make it hard to tell if they are cooling at all. The inefficiency pretty much precludes running them on electricity unless you are hooked up to shore power. They use roughly a pound of propane per day, or about a gallon every four or five days. On electricity, this would be about 6 KWH or 500 amp-hrs a day — too much to run off a battery unless you have a huge battery system. We had one of these fridges on our last RV, and after living with it for some time, one of my goals on this conversion was find a better solution. Electric compressor fridges are like conventional household fridges that use a compressor based refrigeration unit. The ones used in van conversions are typically smaller, but work the same way. In our conversion, we used a Norcold NB751 three cubic foot model that uses the Danfoss refrigeration unit, which is known for it good efficiency. I tested the actual energy used by our fridge over a couple days as reported here… Basically, under typical conditions it uses 570 watt-hrs or 42 amp-hrs a day. This is by a good margin the largest battery load in our conversion, using about 25% of the total battery capacity in a day. There are other commercial fridges that use the efficient Danfoss compressor (eg Nova Kool, ARB). Fridges that use the efficient Danfoss (or an equivalent) are probably worth looking for even though they are more expensive (our fridge cost about $650). Engel 27 qt compressor fridge. These units can be built into a galley cabinet so that they pull out to allow the lid to be opened when you want something. Or, I suppose they could be placed for use as a seat. The Best Refrigerator Central site provides a pretty detailed comparison between the models of portable refrigerators that use a compressor based cooling unit. But, their energy use comparisons don’t make a lot of sense. If you want a large fridge, some of the brands intended for off grid solar home use might be a good choice. SunFrost and SunDanzer are examples — make sure you are sitting down before you read the price. You might be tempted to use a “Dorm” style compact fridge, but they can be very inefficient. This article from Consumer Reports tests a Magic Chef 4.4 cf model that uses 1900 watt-hrs (158 amp-hrs) per day — this would have drained our set of two golf cart batteries house battery in a day. They can actually be less efficient than full sized home fridges because of the way the condenser coils are built into the fridge wall. This Frigidaire compact also tested by Consumer Reports did much better at about 630 watt-hrs per day — but got poor user reviews. Typical small built in fridge. Most conversions include some form of sink in the galley for food prep and for washing dishes. 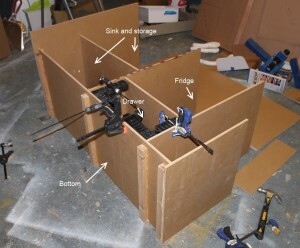 A lot of conversions use a bar sink size unit to save some space. This is the unit we used from Houzer. 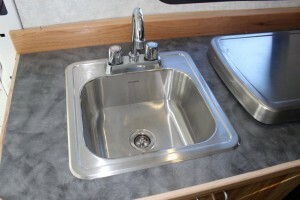 It is sold as both an RV sink and a bar sink. The faucet is a standard plumbing item. The drain plumbing on our sink is standard household sink drain plumbing with a regular trap. The drain water from the sink in our case goes to a grey water tank mounted under the van. 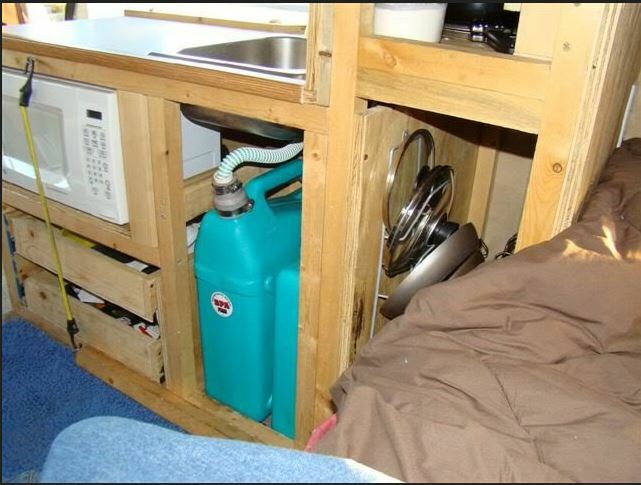 But, its also possible to have the grey water run directly into a container mounted under the sink or to a container sitting just outside the van on the ground with a drain hose going through the floor. 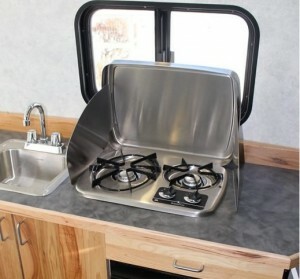 One simple approach is to use this kind of folding camping sink. I am in southern california and purchase a 19 mercedes sprinter. 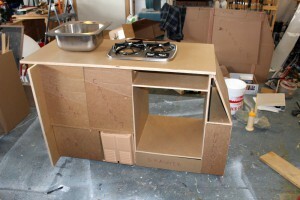 Looking for a kitchen unit as shown in your illustrations.. Can I order this remade and have it shipped to me. The galley unit I have is a one off unit I made to fit our specific needs. I don’t sell anything, so can’t help you on one to fit your van, but I would think that any descent carpenter could make one for you. Or, you might check with some of the van conversion places like Sportsmobile to see if they will make one to your specs. we got an instant pot for our sprinter and i think it is almost perfect in many ways for a camper van. its is a combination pressure cooker, slow cooker, and warmer. most significantly, it is very energy efficient and fast. the pressure cooker is designed so very little steam is emitted, since the power is throttled once the target pressure is reached. a meat stew can be ready in one hour using less than 100 watt-hours. I guess you would have to ask Great West about an exact replacement, but if you just want a small RV sink, there are choices. Its sold as both a bar sink and an RV sink. Bought it at the local Home Depot. I have seen some imported sinks in which the faucets fold flat and then a glass cover fits over the top of the sink so that you get some extra counter space when the sink is not in use. Gary, I bought a 4.4 c.f. magic Chef that is rated at 228 kWh (Energy Star). it’s a fair amount bigger than I was hoping for, and it’s also incredibly quiet. I guess I will have to make provisions for ventilation around it. Do the RV units like yours have a fan for that? I see that the guy who insulated that Igloo unit has a PC-type fan in what looks like a duct right next to it. Next step: to add more insulation. he used the pink stuff, but I generally prefer the foil-faced poly boards. Nice — looking forward to hearing how it works out for energy and noise. My fridge does have a fan, and its an appreciable component of the noise it makes. RD on the ProMaster forum has worked out a way to control the fan with a temperature sensor so that it does not run except when needed. It seems like the foil faced polyiso boards would be a better choice, as it has a higher R value per inch. What kind of wire did you use for your mini fridge? Is it AC or DC power? For my Norcold 751, I just used the Romex 14 gage. Its a DC powered fridge. They do recommend twisting together the positive and negative wires for the last foot before the fridge, so I opened up the Romex outer plastic sheath, twisted the black and white wires together, and then used electrical tape to put the outer sheathing back on. 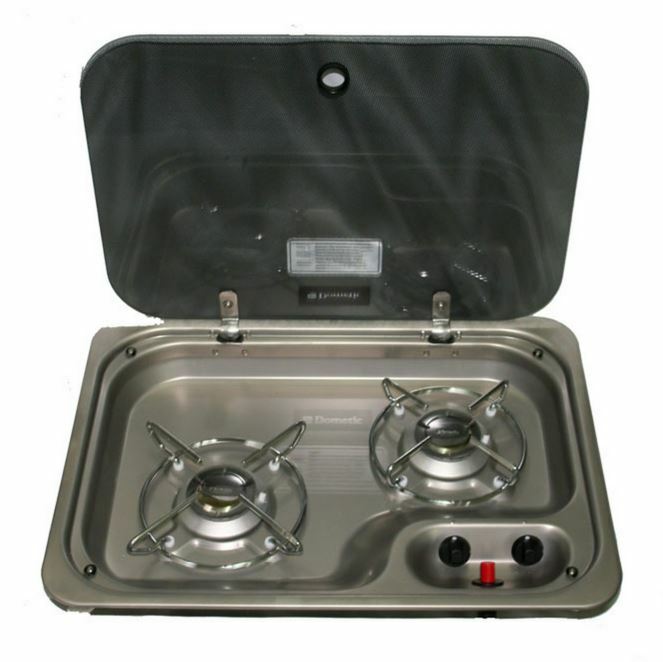 Is an RV propane stove top dangerous to use in the van? I’m concerned about carbon monoxide. If so, how do you address these issues (aside form a Carbon Monoxide detector)? I don’t think its really much of an issue — millions of vans and RVs use them, and it seems like its by far the most common solution. I guess you can always make sure there is plenty of ventilation when using it. We usually crack the window behind the galley and open the roof fan a little when cooking — this is as much for getting rid of cooking odors as the CO.
I’ve never had the CO detector go off while cooking. Some people have gone over to electric induction cook tops, which probably means upsizing the batteries a bit. A lot of people like to use a propane or butane stove that is not attached so that they can cook outside — this seems like a good idea to me, and I might switch over to this just because I like being outside. Thanks for the review on the Smev stoves — they do look very nice, disappointing that they don’t hold up better. Thanks for such an awesome website. My wife and I are outfitting our van right now and starting to lay out the electrical. We’ll be moving back to WY next year, so we’ll be neighbors soon enough it would seem. One major question I have for you regards the fridge. The manual for the small Norcold refrigerators recommends starting the fridge on AC and then maintaining on DC. I don’t plan to run two connections to our fridge, and I also don’t plan to leave the electric on 100% of the time. Are you only running a DC connection to the fridge? If so, do you have any issues going from room temp to cool with your system? I run the fridge on DC only and have not had any problems, and I have heard from at least one other person that does the same. Maybe worth a call to Norcold to clarify what they mean by starting on AC, but I don’t think its necessary on the 751. We rarely have the inverter turned on at all as almost everything we have runs on 12 VDC — this is nice in that you don’t have the inverter power drain and fan running all the time. 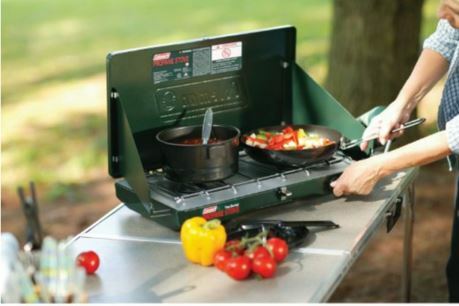 What do you think about the propane camp stove/oven combos? 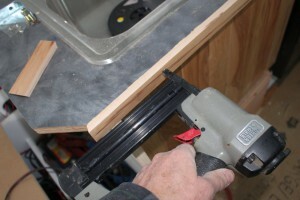 What would you do to make sure it’s safely installed in the counter? Aluminum flashing maybe? 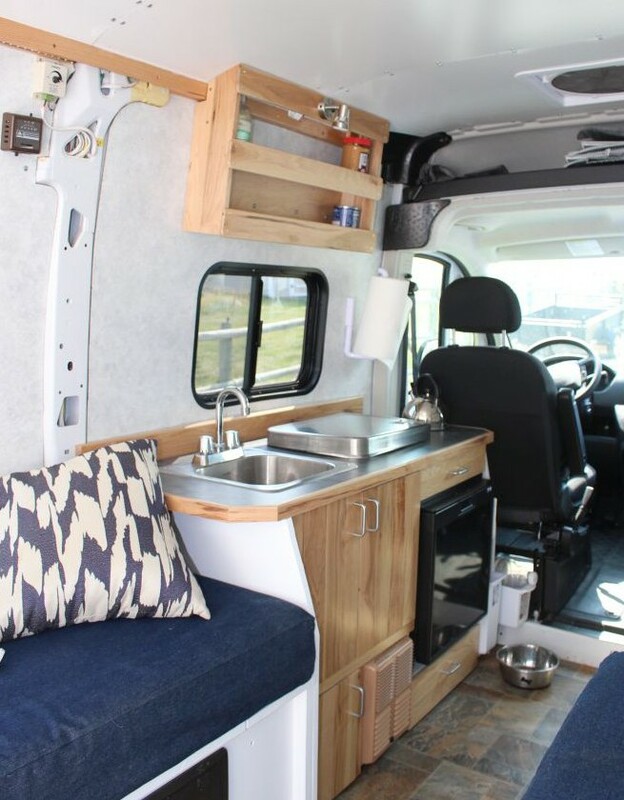 The camp stoves are pretty popular for van conversions. I think what a lot of people like about them is that you can move them outside to cook when the weather is OK and that is nice. Had we thought about this more, we might have gone for the camp stove approach just to get the outside cooking feature, although our fixed stove has worked out well. The propane stove we have in the van now comes with a stainless steel cover that hinges up and then a metal wing swings out on each side so the back and the two sides are enclosed with fireproof metal. When I bought the stove, I thought the feature was of doubtful use, but we end up using the back and side shields all the time and I do think they provide a helpful safety feature. So, maybe a camp stove that has these kinds of protective cover and side shields would be worth looking for — I think that a lot of these stoves have them. Have not seen a camp stove with oven, but the oven sounds useful. 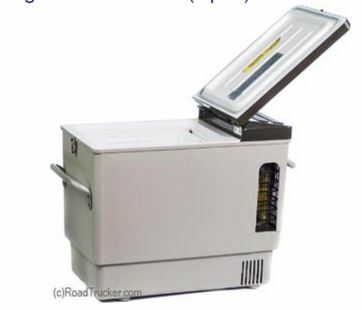 I think you will want a way to secure the camp stove to the counter both for when you are cooking and when you are on the road. Maybe some kind of clamp that is quick to use? Please let us know what you end up with. I know what kind of sink you are talking about — once road a train that had them. But, don’t know where you would get such a sink. I just found your great website. Looking for a source for a compact folding/tilt bath sink, like the “Pullman” sinks on train berths years ago. Also have seen similar sinks that rotate into wall and spill to back on smaller RV/campers, but have not been able to locate parts source. Any resource info would be appreciated.